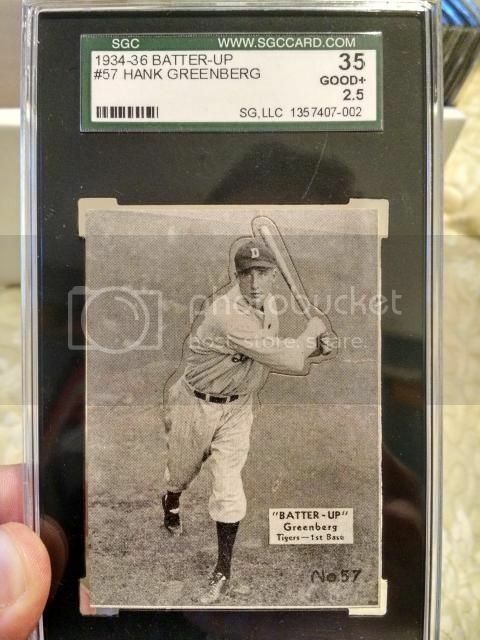 As some of you may know, I've been working on this 1934 Batter Up color run for the past couple of years. I had been eluded by the black, blue and browntone version for some time. 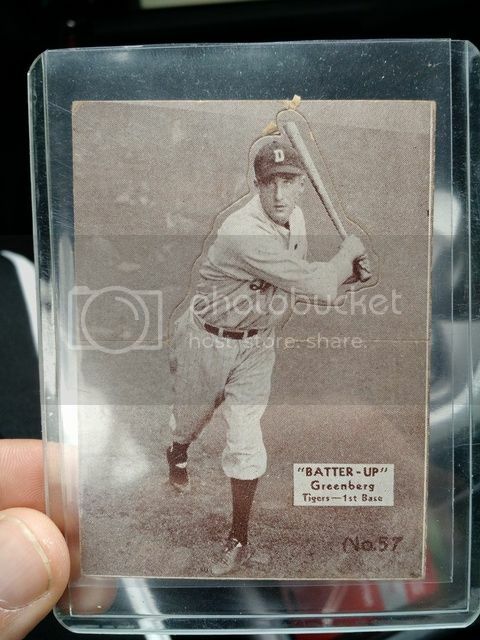 Greenberg, because he is #57 in the set, has 4 color variations, black, blue, magenta and browntone. To tell the difference between the browntone version, and the black version is quite difficult if you don't have the cards next to each other, the other two are quite easy to spot. 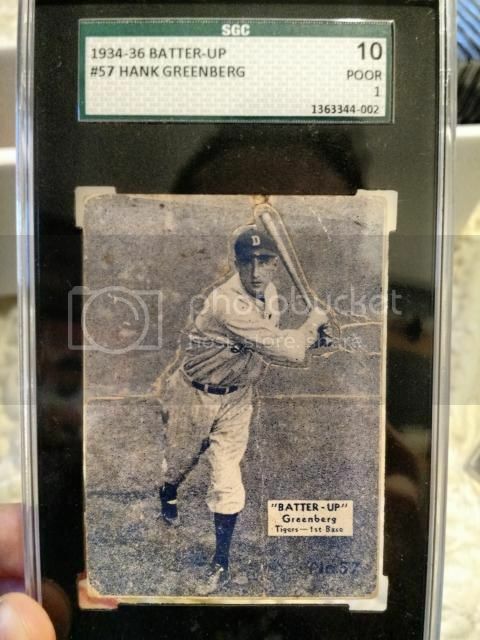 I took a chance on this card on eBay, it came yesterday, and almost to my surprise, it was the browntone version! Very cool; not sure how many people know the "rainbow" terminology on the board. For modern collectors, it's getting every colored parallel of the shiny cards they put out nowadays. Nice way to turn it to a vintage term! 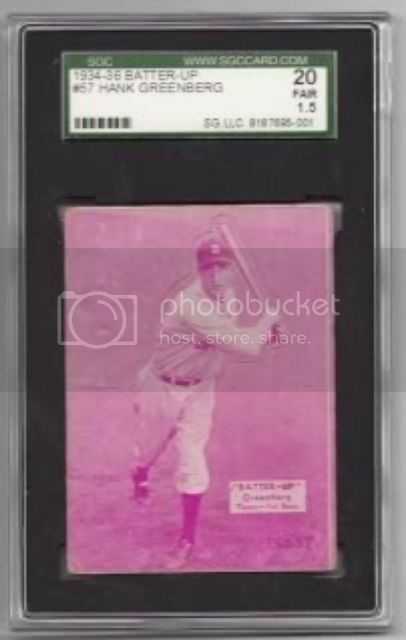 I like the Batter Up colors. But aren't there more than that? I see you answered concerning the Greenberg in the series, but other players have other cool colors too... Nice pick up on the bay to finish the run too!! Last edited by Leon; 04-11-2015 at 07:52 AM. Well done, I knew you were on a mission. The Green and Red tone cards are only found with numbers 1-40. 41-80 are found with the four colors as with Greenberg. I think purple and brown are probably the most common, followed by black and then blue. Green and red are the least common of the low number cards. As far as the high numbers, the colors are tough to distinguish online, but blue seems to be somewhat less common than the others.